Beginning this Saturday, BBC Radio 4 will be unearthing some of cinema’s buried treasures in a series called Unmade Movies. Tune in to dig into the past and hear previously unproduced screenplays, by some of the most important authors of the twentieth century—including Arthur Miller, Orson Welles, and Alfred Hitchcock—transformed into radio dramas. James McAvoy, Hugh Laurie, and David Suchet are among the actors who will lend their voices to the program, which will be broadcast over the next three weekends. First up is “The Hook,” featuring Suchet in the lead role of a 1950s drama that Arthur Miller developed with Elia Kazan, which never saw the light of day because Miller refused Columbia Pictures' demands to turn his script’s villains into Communists. The following week, McAvoy will take on a long-abandoned Orson Welles adaptation of Joseph Conrad’s Heart of Darkness (when RKO Pictures balked at the size and cost of the production, Welles turned to a different project, called Citizen Kane). And to cap the series off, Laurie will star in “The Blind Man,” Alfred Hitchcock and Ernest Lehman’s murderous tale of a jazz pianist, which was discovered by the program's producer in a library at the University of Texas. 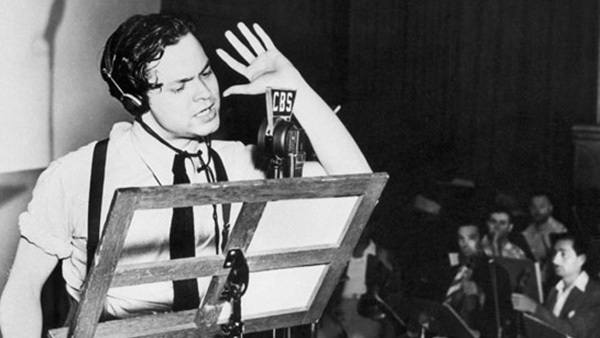 And if you’re in the mood for more radio drama, you can stream Orson Welles: The Ultimate Collection—a compilation of the master’s radio broadcasts—on Spotify. This incredible trove of programs features Welles’s legendary broadcasts of A Christmas Carol and “The War of the Worlds” alongside a production of Dinner at Eight led by Lucille Ball and Hedda Hopper, as well as Welles and Gertrude Lawrence performing Noël Coward’s Private Lives, and much more. Have a listen below.